After weeks of bitter cold, Raccoon Creek was icy and quiet yesterday when the temperature reached 55 degrees at the Wildflower Reserve. Muddy water flowed through an ice-free channel but after two warm days the creek was high and made soft gurgling sounds as it passed under the remaining ice. It looked peaceful while I paused to eat my lunch. Then crack! Boom! Upstream a large slab of ice broke free, crashed into a submerged tree and jammed. More ice joined it, spinning in the flow. The pressure cause a big section to break free and scrape the shoreline with an ugly tearing sound. Chunks from the breakup floated down to a small jam in front of me. When they reached the blockage their back ends tipped down, their noses tipped up, they flipped over, submerged and were sucked under the ice sheet. I watched them pop out on the other side and bob downstream. This didn’t last long. Soon the entire channel filled with ice, the water rose rapidly and flooded the shore. Then the ice rose too, buckled and broke. Jamming and breaking, the amazing thing was that this action was caused by liquid and solid water rubbing up against each other. I’m glad the episode at Raccoon Creek was small. I didn’t get wet. 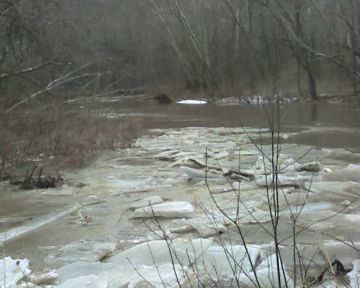 This morning’s news reported an ice jam on Neshannock Creek in Lawrence County where three people were rescued from the rising water.